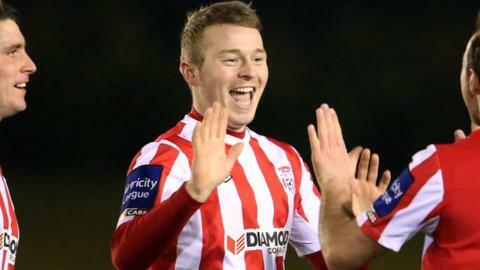 Derry City striker Michael Rafter has moved to their League of Ireland Premier Division rivals Cork City. Rafter, 21, arrived at Derry from Dundalk last December and went on to score 12 goals in 19 appearances. New Derry manager Roddy Collins has immediate decisions to make as a number of the club's players are currently out of contract. Derry's leading goalscorer this year Rory Patterson has agreed a new one-year deal with the Candystripes. Cork City manager John Caulfield spoke of his delight at securing the signature of Tipperary native Rafter. "Michael got twelve goals from just nineteen starts last season with Derry," added the Cork boss. "He has shown the potential he has, so we just need to get more consistency from him. "He's only 21 and he's a very attacking player."